1 Preheat oven to 375°. In shallow 8-inch baking dish, arrange blueberries; set aside. 2 In medium bowl, combine flour, brown sugar, oats and cinnamon. Stir in Hellmann's® or Best Foods® Real Mayonnaise. Using fingers, gently squeeze dough to form crumbs. 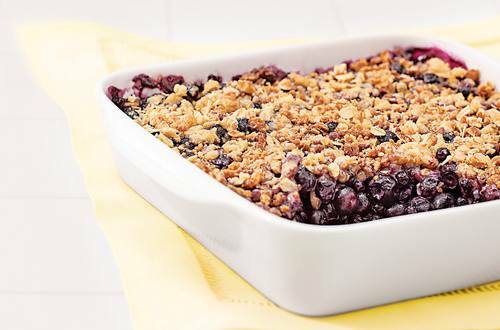 Evenly sprinkle crumbs over blueberries. 3 Bake 30 minutes or until topping is golden. *SUBSTITUTION: Try using 1 package (12 oz.) frozen blueberries or 1 can (21 oz.) blueberry pie filling instead of fresh blueberries.